Kids adore Colin Thompson's brand of off-the-planet humour. Now here's an off-the-planet series to make them laugh even more! Three years ago, Stark Contrast volunteered his family to live on the moon. Since then, the reality TV show about their adventures has become the most pop... read full description below. 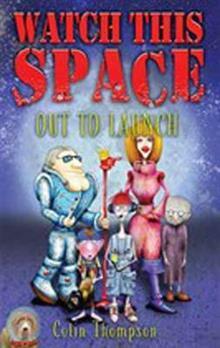 Kids adore Colin Thompson's brand of off-the-planet humour. Now here's an off-the-planet series to make them laugh even more! Three years ago, Stark Contrast volunteered his family to live on the moon. Since then, the reality TV show about their adventures has become the most popular show on earth and the Contrasts are mega famous. But three years inside a big plastic bubble is a long time, and the four of them - Stark, his wife, Laura, and their children, Crocus and Jack - are way beyond bored. They just want to go home. The trouble is, none of them know how to fly the spaceship, and it's not programmed to take them home for another two years. In Watch This Space, with the help of the robot that was sent with them, the Contrast family manage to break into the spaceship and escape ...except that instead of flying back to earth, the spaceship heads off into deep space. The series will be their attempts to return home via a series of incredible, ridiculous, scary and just plain weird planets.